The Pyrex Simply Store Storage Set, a lot of S's, is a bit difficult to review. Because it seems as though the material of the containers has changed fairly recently, but we will touch on that later. These currently have a 4.3 star rating on Amazon, and carry the badge for Amazon's Choice. So let's see what is the issue with these food storage containers. The Pyrex Simply Store Storage Set have a pretty large reputation to live up to. Pyrex is one of the best food storage brands out there and from first looks, it seems their Simply Store set lives up to those expectations. To an extent anyway. This set is made of Pyrex glass, which is durable and safe to put in the microwave* (I'll get to the asterisk later). Because these are made of glass, they are a bit heavier than plastic or steel variations. However, they are not overly bulky and the glass does come with a feel of higher quality to it, which is always nice. Glass is still the most recommended material when it comes to food storage because it is the most eco-friendly and easiest to care for. Speaking about care, the Pyrex Simply Store Storage Set is very easy to clean. It is dishwasher safe, so when you are done you can simply toss it (place it) in the dishwasher and you are ready to go. Plus, glass is very easy to just wipe clean as well, as there are no weird corners or folds as there may be with plastic. The plastic lids are also dishwasher safe, but should be placed in the top rack. In terms of build design, these are very space savvy. They can be stacked on top of eachother, without fear of collapse or crumpling. Of course, there may be an issue if you try to stack different shapes on top of eachother but if you stick with like sizes and shapes, you should be fine. The 18-pack comes with two of each size container. So (2) 2-cup round containers, 4-cup round containers, and 3-cup rectangular containers. There are a bunch of great features with the Pyrex Simply Store Storage Set. First of all, the glass containers are dishwasher safe, as well as microwave safe*, pre-heated oven safe, and freezer safe. Is makes saving and reheating leftovers incredibly simple and easy. Saves time, as well as effort. However, you should avoid microwaving with the lids on, as the lids may get damaged. Speaking of the lids, these come with an airtight seal. Meaning that your food will stay fresher, much longer. Plus they are able to be frozen, which extends the freshness time even more. Because the lids are plastic, they are able to securely and tightly fit around the glass mold that is the container, creating a very snug and secure seal. The sizes of these, like I mentioned before, makes them very space savvy and easily stored. The two largest sizes come in at 7" round by 3" tall, and 8 1/4" long by 6 1/2" wide and 2 1/2" tall. The others decrease gradually in size after that, each one smaller than the last. This makes the Pyrex Simply Store Storage Set simple to stack and place in the fridge or cupboard, depending on the type of food. Pyrex is a well known food storage and kitchenware brand. They are actually licensed trademarks of the Corelle brand, which has various brands in its family. They have been making kitchenware products, especially glass products since 1908. However, their materials seemed to have changed in the past few years, and not for the better. But more on that later. Pyrex Simply Store Storage Set is made from durable glass. The glass makes it dishwasher, microwave, freezer, and preheated oven safe. It also makes these containers fairly easy to clean, as there are no odd corners or folds like there often are with plastic. These containers are very space savvy. Due to the variations in size and shape, they can easily be stacked and placed in the fridge or cupboard, depending on the contents. Plus, because they are made of sturdy glass, you do not have to worry about crushing or crumpling happening. 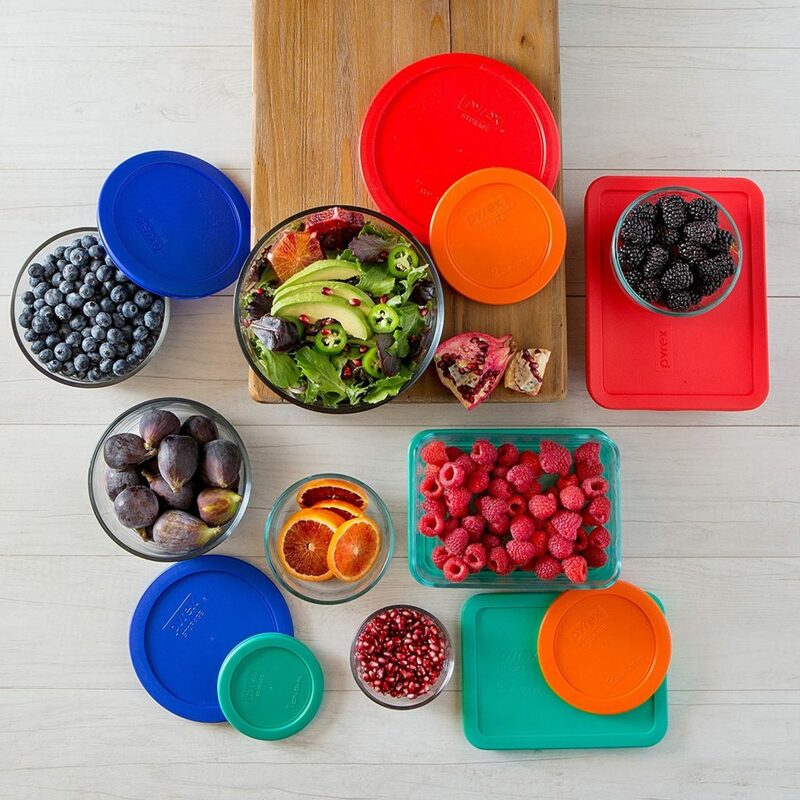 The lids offer great saving of any leftovers that you may want to save for later. They offer an airtight seal, which seals in flavor, aroma, and freshness for an extended period of time. Plus they are BPA free as well. While the overall build quality seems good, the lids may be the exception. Customers have reported that the lids tend to crack and bend easily, leaving cracks in the plastic where they bent when opening. This definitely brings down the quality a bit and completely destroys any airtight feature they may have had going for them. The biggest complaint from customers is that it seems the containers are not as microwave safe as is claimed. There have been multiple reports of the containers basically exploding in the microwave. This is where we touch on those *asterisks*. These Pyrex exploding reports are not just from Amazon reviews. There are hundreds of accounts on Google just by searching Exploding Pyrex. All claiming roughly the same thing. That after placing them in the microwave, the glass shattered and went every which way. Apparently, there has been a change in building materials in the last few years. The Pyrex glassware was originally made from borosilicate glass, but is now made from tempered soda lime glass. I am not a glass expert but from the looks of things, this soda lime glass is not holding up as well as the borosilicate glass did. Because of this change in glass material, I am very wary to fully recommend these. I do not want anyone to get hurt if these suddenly explode in your microwave. However, Pyrex a long time maker of glassware and kitchenware products and have basically become the standard for them as well. So I would say keep an eye on them and if they change the glass material again, maybe give them a try. But if you want to give these ones a try, you can find them on Amazon for $30.71. For any other information, including the best food storage containers, check out the rest of Green and Growing. Here are some top questions that I found for people seriously considering buying the Pyrex Simply Store Storage Set. Are the lids BPA free? Yes, they are. What is included in the 18 piece set? 9 containers, 9 lids.